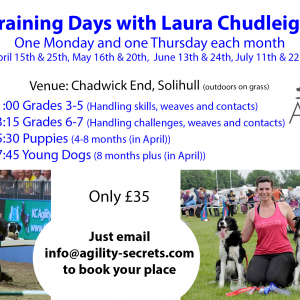 Here at Agility Secrets for the 6th year running we are offering only the very best UK Training Camps, Training Days and Guest Trainers from around the world. We select the very best trainers to help every type of person and dog get the best out of their partnership and offer training for every level, age and breed of dog as well as for every level and age of person too. Below is the list of Camps, Training Days and Guest Trainers we have coming up soon, just click on each event for more details. Our events always fill up quickly so we recommend you book now. If there is an event you would like to book on which is marked as full you can join our reserve list as places often become available closer to the time. This page is regularly updated with new dates and events so check back soon or follow our Facebook page; you can also be the first to know about any new events coming out before they get onto our website by please joining our mailing list which will also give you access to exclusive offers, training and much more.